Aswan is the most southern city in Egypt, and has been the border city between Nubia and Black Africa since ancient times. 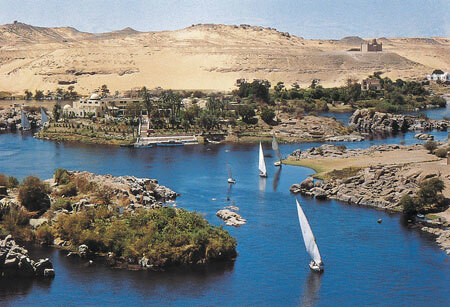 Its picturesque location on the Nile makes Aswan an impressive, idyllic city. The atmosphere at sunset reminds guests of the era of Agatha Christie, who penned her famous novel "Death on the Nile" in the famous Old Cataract hotel. Aswan lies 800km south of Cairo on the first Nile cataract. A trip to this charming location, with its characteristic sailing boats on the Nile, is an essential element of a holiday in Egypt. Sail to Elephantine island, buffeted by the feluccas’ white sails, and visit the Aga Khan’s mausoleum with its wonderful view over the Nile. The Isis temple on the island of Philae was flooded after the completion of the new embankment dam, and was thus moved to the neighbouring island of Angilkia. The temple is an enchanting place to visit during the daytime, but the evening sound and light show makes a nocturnal trip an unforgettably romantic experience.